Austen was a Sagittarius but the first thing that stands out is the fact that the Sun is in the 4th house at the very base of the chart. The 4th house is our home base, it rules our relationships with our parents and family and also with the past and tradition. It rules land and the natural environment where we come from. The Sun’s house placing in a chart shows an area of life that we feel comfortable and secure with. It’s often a place where we will spend a large part of our life. Austen lived her entire life as part of a close-knit family located on the lower fringes of the English landed gentry. She was educated primarily by her father and older brothers and the steadfast support of her family was critical to her development as a professional writer. Her Sun is in opposition to the noble Jupiter at the top of the chart. Jupiter at the Midheaven promises great success in the chosen career. As Jupiter is in Gemini, the sign of communication both verbal and written, its appropriate that Austen was a writer. Her novels are based on philosophical ( Sun in Sagittarius ) observations of life amongst the landed ( in the 4th house ) gentry ( Jupiter conjunct the Midheaven ). The opposition on its own might lead to a sociological discourse about the lives of people in the early 19th century, but the Sun and Jupiter are part of a T Square focusing their energies onto Neptune and a Virgo Ascendant. The Sun’s square to Neptune is exact, they are only 4 minutes apart. Neptune is the planet of fiction and fantasy that provides the novelist’s imagination. An apex Neptune rising gives an extremely sensitive nature and an ability to pick up many deep and profound impressions from any situation. It also gives Austen a profound empathy with people in general but her characters in particular. Such a strong Neptune could be prone to flights of unreal fantasy but an analytical Virgo Ascendant brings the practical realism, biting irony and social commentary that gained her historical importance among scholars and critics. Austen’s novels are of romantic fiction and her plots highlight the dependence of women on marriage to secure social standing and economic security. This can be seen by the Moon in her chart. The Moon is in Libra, so the fundamental concern for the female heroines ( Moon ) is to look for the perfect relationship ( Libra ). Her novels deal with the difficulties in achieving this status with the desired partner and often having to choose between settling for someone less desirable but more materially secure or missing out altogether. The Moon is conjunct Saturn and Saturn’s raison d’être is to force the individual to get on with things and settle for something practical rather than follow their own dreams. Jane Austen’s plots seem to be the perfect expression of the Moon ( women ) in Libra ( in search of marriage ) conjunct Saturn ( but being held back ) on the cusp of the second house ( for reasons of money and security ). It is often true that artists, actors and writers who are strongly identified with a particular piece of their work have symbolism in their charts that describe the work as well as themselves. The plot of Jane Austen’s most famous novel Pride and Prejudice centres around the tensions ( opposition ) between a headstrong, carefree and emotionally honest and direct character in Elizabeth ( Sun in Sagittarius ) and Mr Darcy a proud and distant figure ( Jupiter at the top of the chart ) who initially feels that consorting with the Bennett family would be beneath him. Oppositions create tension but they also attract and over time Darcy falls in love with Elizabeth but she rejects him due to his earlier attitude and to a misunderstanding ( Neptune ) about his role in the fate of another family member. Jane Austen never married but she did receive one proposal of marriage from Harris Bigg-Wither, a man who was unattractive, spoke little and stuttered, was aggressive in conversation, and almost completely tactless. However, the marriage offered many practical advantages to Austen and her family. He was the heir to extensive family estates and with such resources Austen could provide her parents a comfortable old age and assist her brothers in their careers. Like any self respecting heroine from her books, Austen refused the proposal. Having never been married, Austen’s mysterious love life has always attracted interest and speculation and there have been numerous attempts by literary scholars to link her with foiled relationships with one person or another. In Pride and Prejudice the misunderstanding between Elizabeth and Darcy is eventually cleared up and they overcome the opposition to marry. This would never happen in real life and for Jane Austen personally the T Square and Moon / Saturn conjunction presented too strong an obstacle so she remained in her 4th house until she died. Austen’s writing apprenticeship lasted from her teenage years into her thirties but her real writing peak came from 1811 until 1816, with the publication of Sense and Sensibility, Pride and Prejudice, Mansfield Park and Emma. She wrote two additional novels during this time, Northanger Abbey and Persuasion, but she died in 1817 and both were published posthumously. 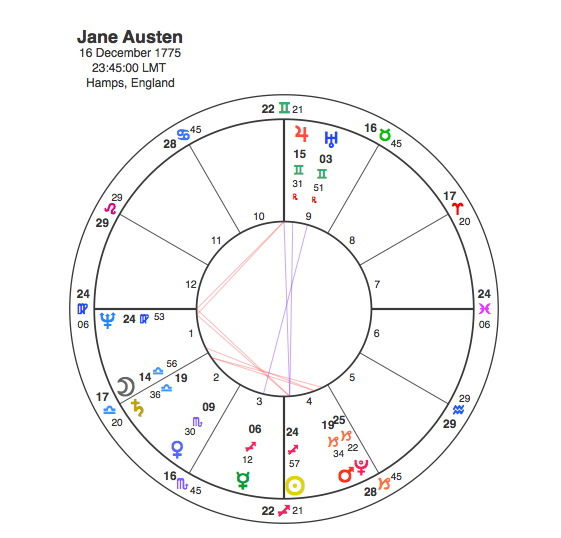 Pluto entered Austen’s T Square with the square to Jupiter in 1811 and was square to her Midheaven and conjunct her Ascendant from 1814 – 16 when most of her books were published. Pluto finished its transit of the T Square with a square to her Sun and conjunction with Neptune in 1816 -17 when she died. Pluto’s transits once again marked the most important part of her life and work. Her work brought her little personal fame and only a few positive reviews during her lifetime. It’s often the case that Pluto did affect individuals even many years before it was discovered but the true impact was often not registered at the time. Pluto was not discovered until 1930 and it was not until the 1940s that Austen had become widely accepted in academia as a great English writer. The film of Pride and Prejudice in 1940 with Laurence Olivier and Greer Garson brought the book to a wider audience and the second half of the 20th century saw a proliferation of Austen scholarship and the emergence of a Jane Austen fan culture. Jane Austen achieved both the Pride of high literary standing through Jupiter in Gemini at the Midheaven and the Sensibility and imaginative expression of Neptune rising. Pluto brought her best work to the fore but also her death in her early forties. Very interesting. I love the way you write and having always loved Jane Austen I was interested to see her chart. Not entirely surprised to see Virgo rising ruled Mercury in the 3rd (although in its detriment in the sign of Sagittarius). How do you think this detrimented Mercury ‘worked’ in her personal and public life? When thinking of the charts of writers I tend to think that they would all have dignified or exalted Mercury’s – although hers is ‘happy’ in the 3rd. I wonder if Neptune ruling her 7th house cusp indicates that men she did meet never came close to the idealised view Jane might of had of what marriage and relationships was ‘meant’ to be….like in her novels. Was surprised to see so many squares and oppositions. Jane certainly overcame. And that for romantic fiction she speaks through Neptune not the unaspected Venus. Neptune also rules her house of marriage (Pisces/7th). She was married to her work (Virgo/ Neptune Asc.) and her career was her passion (Mars conjunct Pluto in Capricorn). Yes very well put. She certainly was married to her work. Thanks.